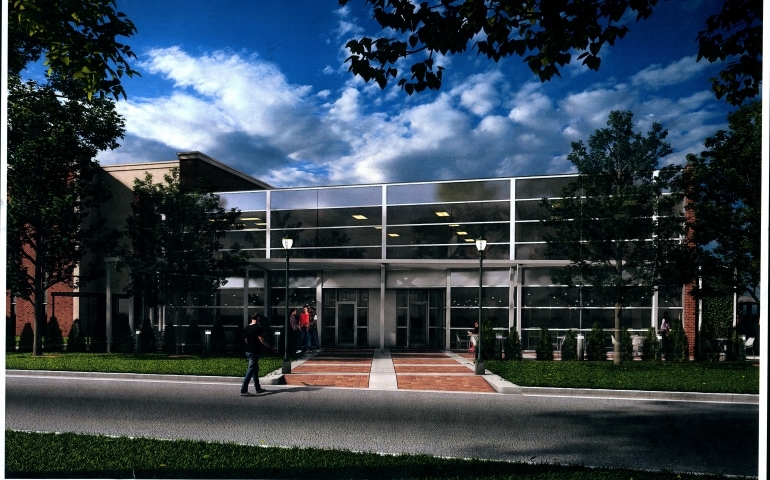 The new estimated completion date for the library renovations is May 9, 2015. The project, unfortunately, underwent delays as they discovered more systems work that would be required to bring the old building back up to the 2015 safety code. The unexpected additional work has increased the estimated cost of the project significantly. While the project manager was unable to be directly contacted, Katie King, Library Director, offered her perspective. King explained that you can leave a building alone without violating code, but when you renovate an old building, you are required to bring it up to current code requirements. As the demolition phase of the project began this semester they began to run into unanticipated repairs that were necessary to bring the building back up to code. One such repair had to do with water damage to the roof. King explained that they had thought in previous planning and estimation periods that the roof could be repaired, but as they began the work, it became apparent that much more would be required than a simple patch job. They continue to run into problems such as underrated electrical wires, illogical organization of the plumbing and other issues that simply go along with any sort of project on an old building. “We discovered we had issues we didn’t know we had,” King said in summary. Senior undergraduate student, Robbie Dias had this to say about the project: “I think it’s great that the library is undergoing renovations. The expansion looks fantastic! The modern feel is exciting, knowing that it’ll encourage students to utilize the resources the library provides. Aside from the addition of the in library Starbucks, I’m extremely excited for the grand opening of the new library.” The coffee shop that Dias refers to is going to be located next to the brand new Center for Student Success offices on the new first floor. King mentioned that the relocation of the offices is the real reason for the new renovation. The idea behind the project was to make the resources that we have more visible and available to the student body. It was thought that placing the coffee shop in such close proximity to the new offices would create a hub of student life and activity near the resources that students need access to the most. The east entrance to the library (the entrance that faces the prayer chapel) is closed. Please use the west entrance for access to the library. There is a doorbell located on the left side of the west entrance for our patrons who need assistance entering the building. The first floor restrooms are closed, but there are restrooms available for the time being on the second and third floor. For now the hot water is turned off to the building. At times throughout the project, water and even power may be switched off for the safety of the workers. If that is the case, it should occur infrequently and for short durations. We do not have an archives room at the moment, so email Corbin Taggart, Director of Archives, for any assistance with accessing archive materials. Above all the library wants students and other patrons to be patient with them as they do their utmost to provide the best service that they can under the circumstances. For constant updates on the construction check out the library website and Facebook page! Overall, it seems that the outlook on the new renovations is one of cautious optimism. Even among the naysayers there didn’t seem to be all that much criticism to be had about the new building. As a student worker in the library, I was able to see a bit of the planning and extensive estimation that went into this project beforehand. All that considered, I think that the people at the top of this project have done their best to make sure that this construction is beneficial to and in the best interests of the campus and the community as a whole. As someone who has seen a lot of poor planning and inferior execution of similar projects, I really appreciate the effort and forethought that has gone into all of this.